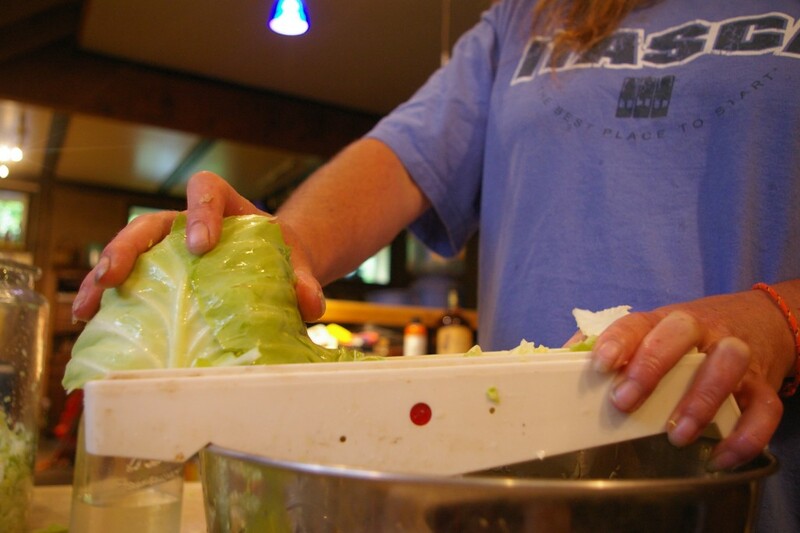 One of the first things sustainable-living folks do is start growing their own food, right? As much as possible in the space available, from a tomato pot on the balcony of a one-bedroom apartment to an acre of shared garden at a friend’s house, we’ve got our hands in whatever dirt is around. And we LIKE it. So, we have quite a lot of trees around our house, so not much sun shines on our wee gardens here at home. Oh, we don’t let that stop us. 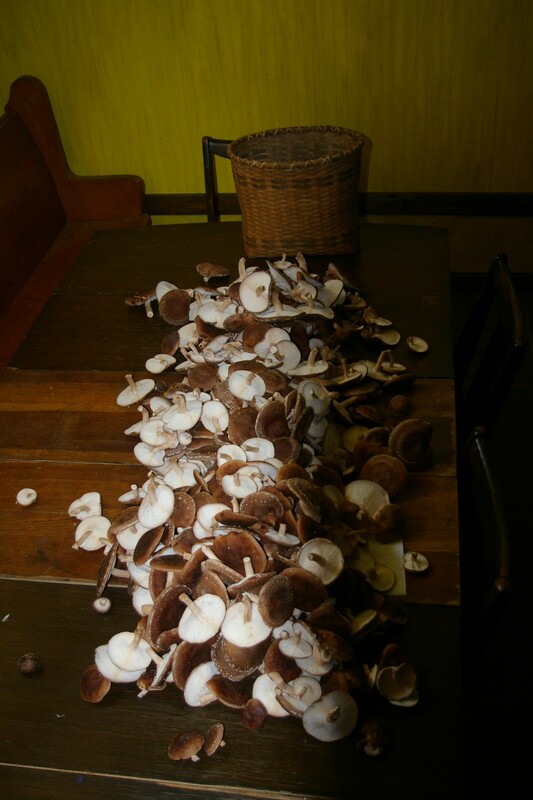 We grow mushrooms. 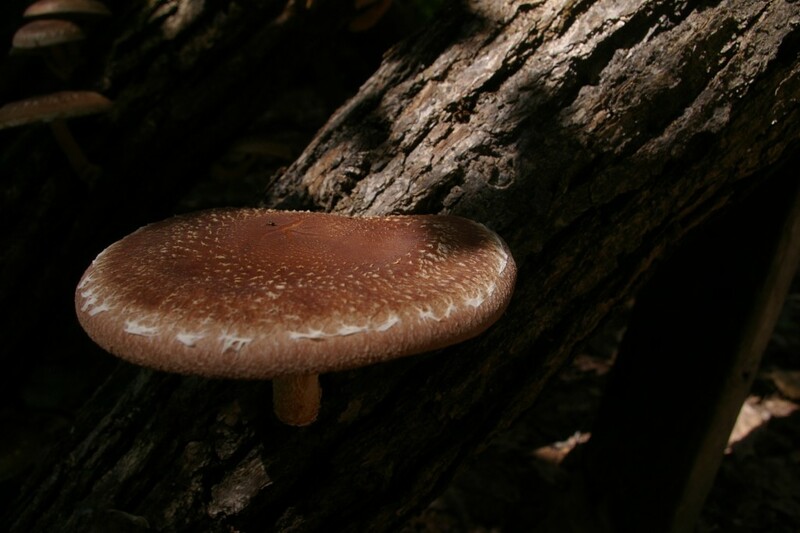 Shiitake mushrooms, to be exact, though we’ve dabbled in other kinds. 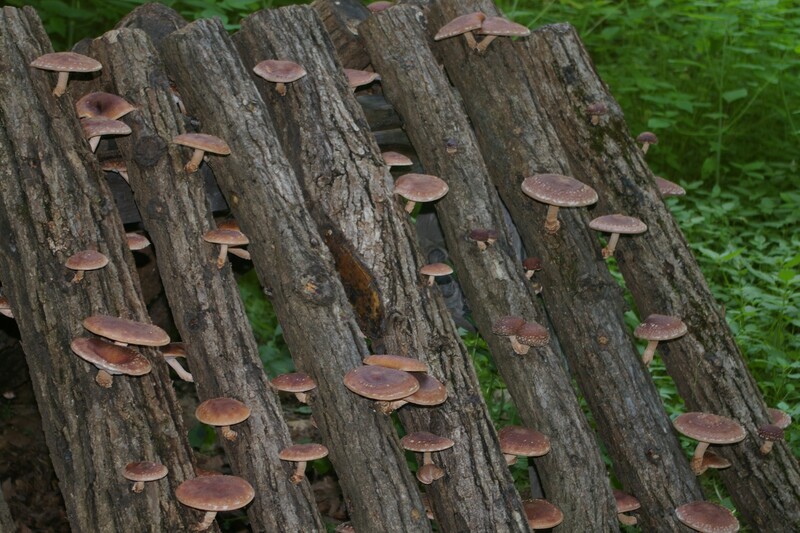 Here’s a quick run-down of how to grow shiitakes: Cut white or red oak down in the spring just after maple syrup season, piece the trees out into four-foot lengths, buy a bag or two of spore from the internet, get your brother-in-law to kindly drill seemingly thousands of holes in the logs, shoot some spore into each hole and cap with wax. Then wait. Well, it doesn’t exactly “appear,” because you have other work to do after waiting. 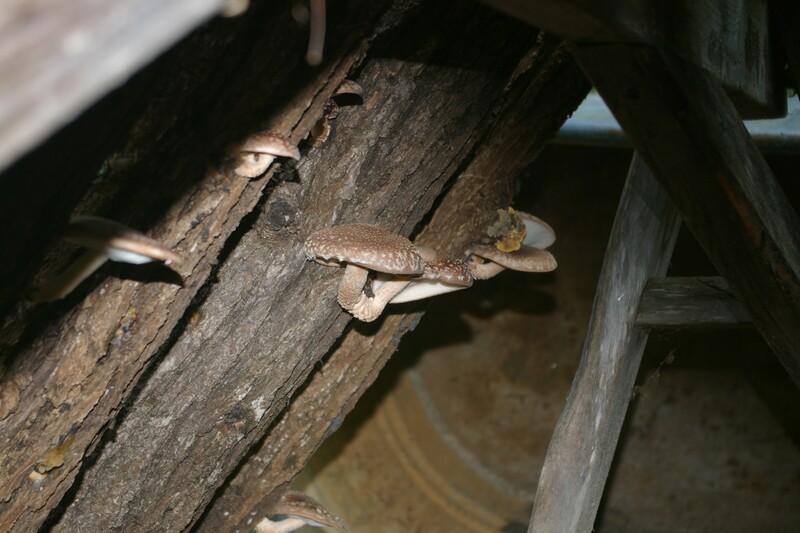 When the weather warms in the spring so it’s consistently 50 degrees at night, you need to soak the logs to force the mushroom flush. 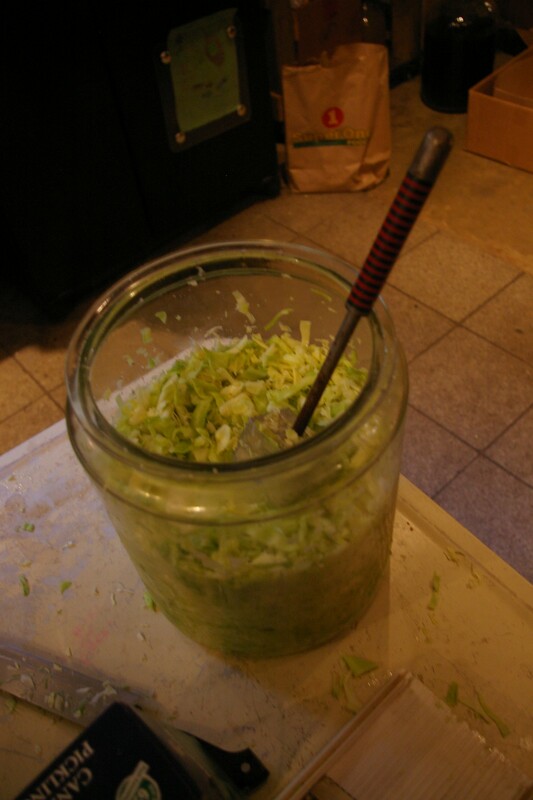 First, put the logs into a fairly large stock tank and fill it to the brim with water. The logs float, so you need to weigh them down with concrete blocks. 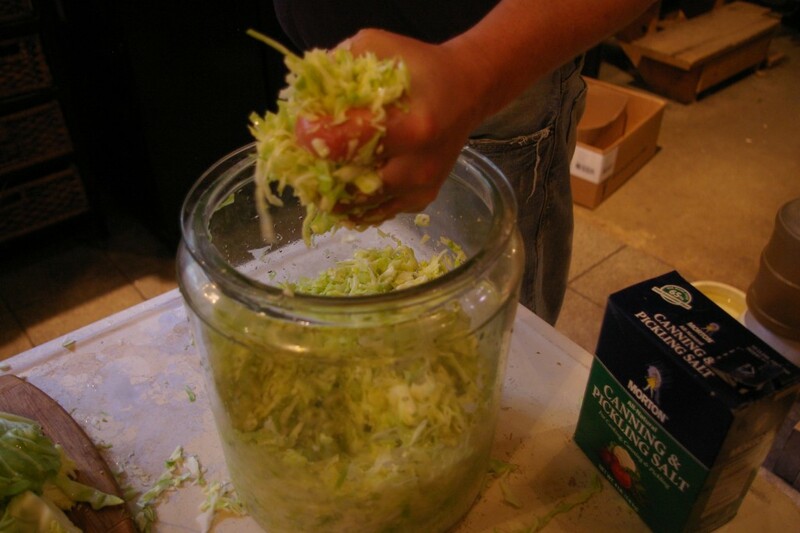 Soak the logs for 24 hours, remove from the tank and prop against sawhorses. Each one weighs between 20 and 40 pounds when they’re dry (depending on diameter) and soaking adds at least 10 pounds, so you’re getting a decent workout when you’re moving 40 logs twice. You do the math; I’m tired just thinking about it. That’s our dining room table, which comfortably seats 8 people. The harvest is spread from end to end of that table. And now you know what 22-3/4 pounds of fresh shiitake mushrooms looks like! Aren’t they pretty? And healthy, and worth some money for folks who buy them by the pound from our lovely cousin. We’ll be drying a number of these and selling them over the winter, too. And eating and eating and eating and loving life. Well worth the waiting and working, my friends. 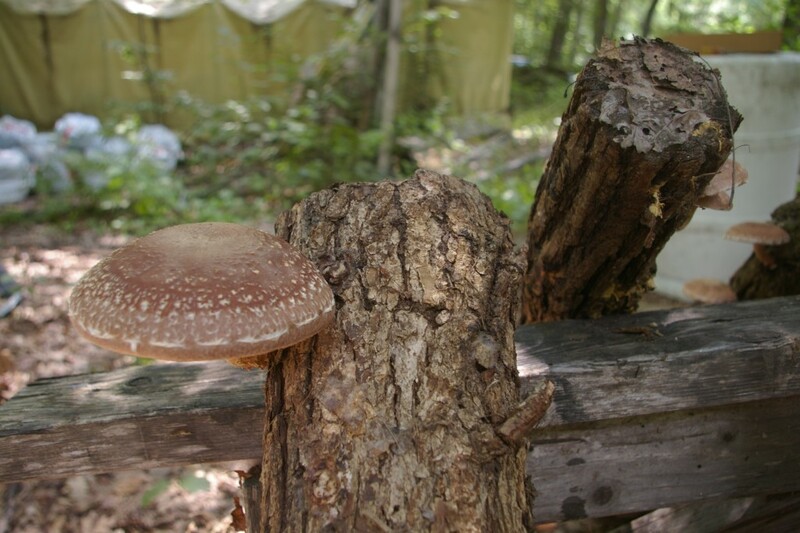 I recommend that if you have a shady yard, you grow yourself some shiitake mushrooms. If you want me to share some recipes in a future post, leave a comment below and I’ll let you know my favorite ways to cook these spectacular shrooms! We’re always trying to learn new things to fill our “life skills bank account.” We’re pretty rich in skills around here… And we try to live the best life possible in the simplest and most sustainable way. And we have amazing fun and happiness, which makes us rich beyond belief. 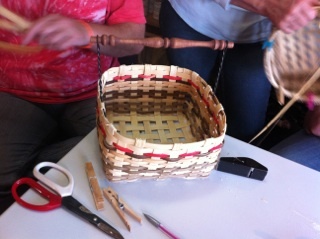 So our weekend skill-building course was learning how to weave baskets. My husband’s aunt has been bugging us for a year to let her teach us, so we settled in for a relaxing afternoon in her cozy Busy Room, surrounded by coils and coils of weaving reed, a sewing machine and ironing board, shelf after shelf of crafting materials, baskets filled with little tools, baskets filled with notions and potions, baskets filled with pens. Wonderful, tiny photos of baby grandkids and dogs that have passed taped up on shelves and walls. Home and family everywhere. It’s the room of a woman who does stuff with her spare time. A woman who lives life with creativity and love and patience and wisdom. 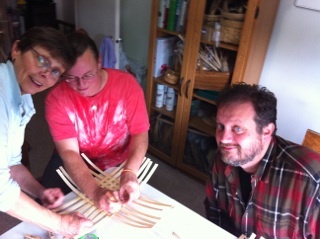 And my husband and I got to spend four absorbing hours creating with her. 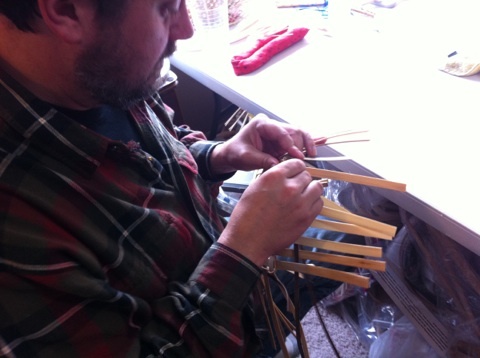 Basically, you weave two lengths of small-diameter round reed to lock the bottom of the basket in place. First reed over under, over under, with the second reed under over, under over, and watch that you don’t get your reeds cross-ways at the corners. It’s all more complex than it sounds, because while your hands are doing one thing your brains are doing another, and if you stop for a sip of coffee or to laugh, everything can get confused. Then you begin to weave in earnest. 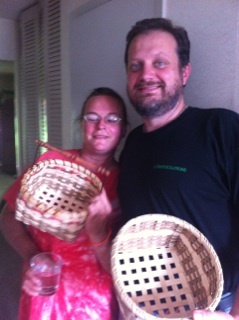 Auntie told us to use smoked reed to make our baskets more interesting. It’s a nice mocha color, and I’m excited to make and smoke reed from scratch someday. 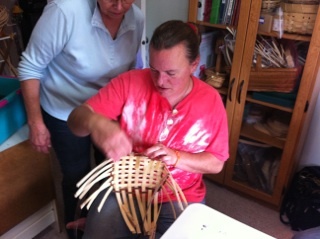 Repeat the over under/under over pattern around each spoke, carefully tightening and pulling and adjusting as you go so the weave doesn’t affect the final shape of the basket. 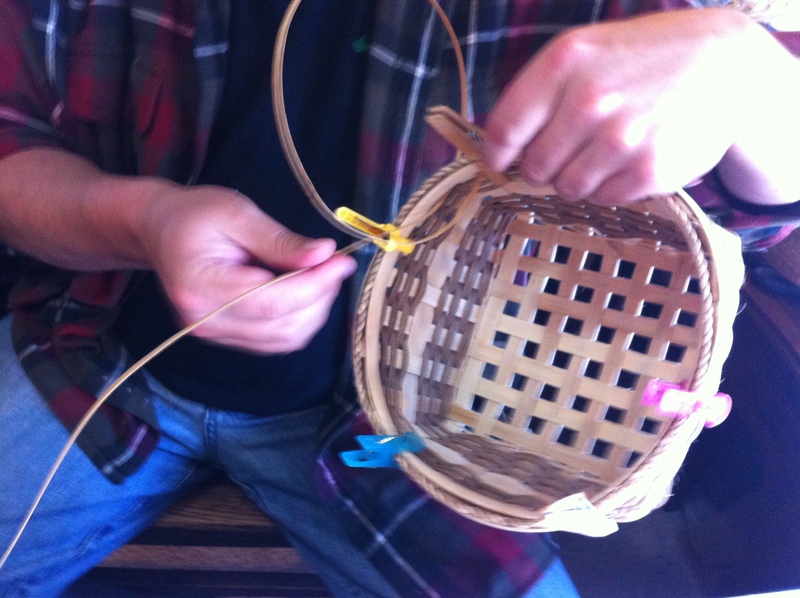 The key to making a basket with strong sides is to overlap the reed ends by four spokes–they won’t pull apart even if you put a bowling ball in the finished basket. It’s tricky to make sharp corners. It’s tricky to pay enough attention to the over under/under over while multitasking conversation about the recent rains, the small patch of blue sky, reports on basket guild, promises to attend weaving classes next winter, discussions about lunch, and small intrusive thoughts about work. This whole thing is trickier than you might think! This is the critical stage where you can completely mess up the strength of your basket or make it a useful work of art that can be passed to the next generation. How you bend and weave and integrate the loose ends at the top makes all the difference in the world. 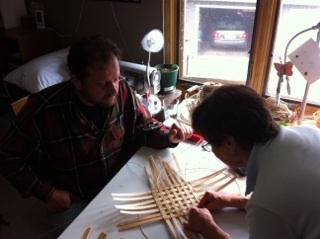 First, half of the stake ends are cut off and half folded over to lock the top weave together. It feels like a moment of no return to snip, snip, snip. Then begins the lashing. That might sound like the most dangerous part, but it’s not. Lashing simply means sewing the top together as tightly as possible, without any of the bits getting cross-ways, or breaking the lashing reed. Yes, I broke the lashing on my basket (twice), and had to try a couple of alternatives before settling on the leather shoelace. Who knew that a found object would become useful in a craft project? It’s as easy as feeding the ends into the weaving and locking it in. 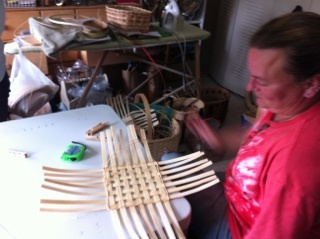 I guess people have thought about how to do this, and have created pre-made helpers, and the simple folks who have never woven a basket can incorporate these items to make a spectacular finished product. Modern life is good for some things, anyway. Nice square corners, straightforward coloring, strongly masculine. A beautiful object of art and love. Jake would like to put his most-used essential oils in the basket to corral them. Purposeful and meaningful. Aren’t we completely beautiful? I adore my sweetheart husband, who is always willing to pose for a photo. I, on the other hand, am attempting to show the final product in its best light while dealing with dehydration brought on by extremely hard work and talking, talking. And struggling like Jacob with the angel to get my rim lashed. But you know what? The final products were exactly what they should be. Filled with emptiness. Filled with knowledge. Filled with family. 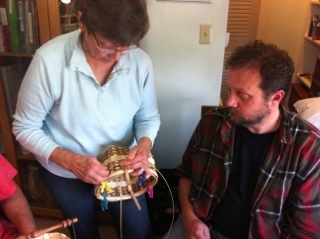 Go out this minute and find someone who can teach you how to weave a basket. Listen deeply to that person, hear the HOW of spokes and twining and stakes and weavers and lashing. Allow the materials to speak to you, and allow the end result to be gorgeous. And be quiet for a few moments after you create your first project, and be in the WHY of what you just accomplished. Home and family. Priorities, all in the right place. Wish you could have been there with us! 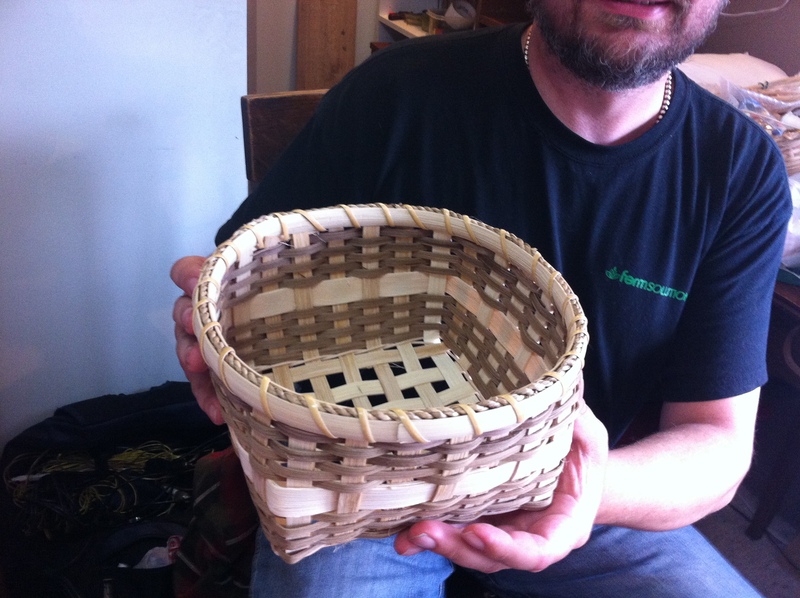 Have you done basket weaving in your life? It seems like a lost art to me, one of the many skills that have fallen by the wayside in the face of technology. 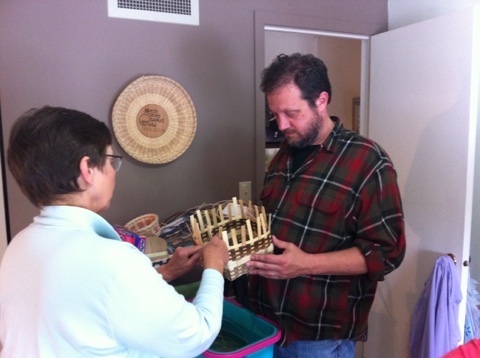 If you have ever woven a basket, please leave a comment here to tell everyone about the HOW and the WHY of your creation. The woods of northern Minnesota provide us with food for body and soul, creating a seamless life that honors seasons and cycles. On the spiritual side, we’re blessed with a peacefulness that can become timeless as the days gently roll along; we’re grounded and in touch and find joy everywhere. It’s a beautiful life. On the physical side, we grow a lot of food in the non-snow months. 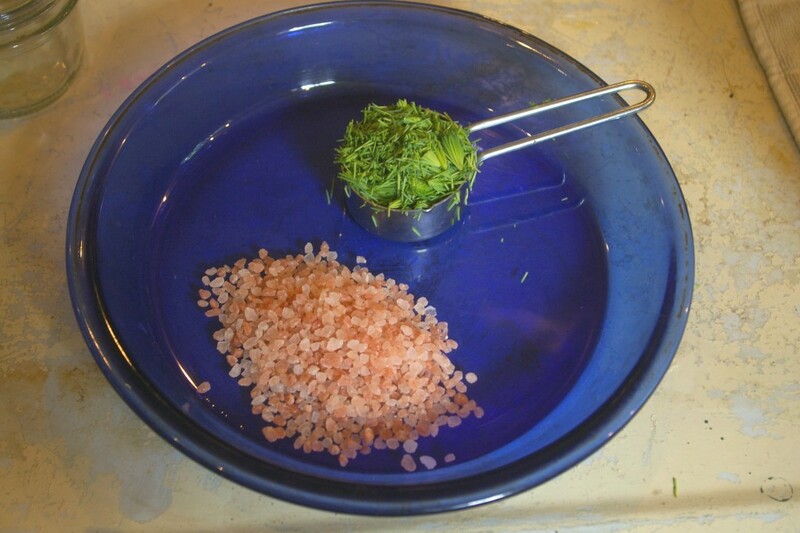 We also hunt for wild foods and try to learn more and more about what nature gives freely according to her own schedule. Yes, we have grocery stores in town; no, we don’t live like a pack of coyotes; yes, we get haircuts when we need them; no, we don’t bathe in the river. We’re modern American humans with satellite TV and hot running water who happen to take every opportunity to homestead, and then we share our projects on Facebook. I do see the irony in that, and am as amused as you are. Maple syrup time has ended for the year, so I’ll blog about that when next April rolls past. 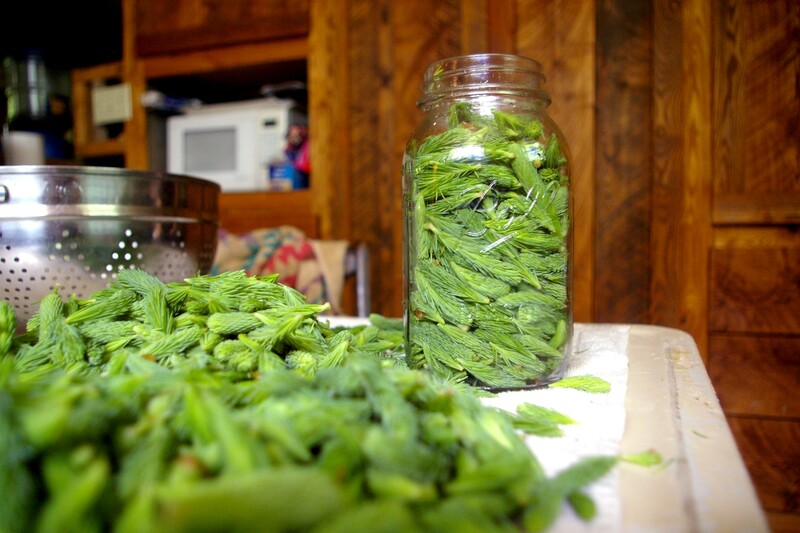 Fiddlehead fern time only lasts for a few days, so you’ll hear about those adventures next May. 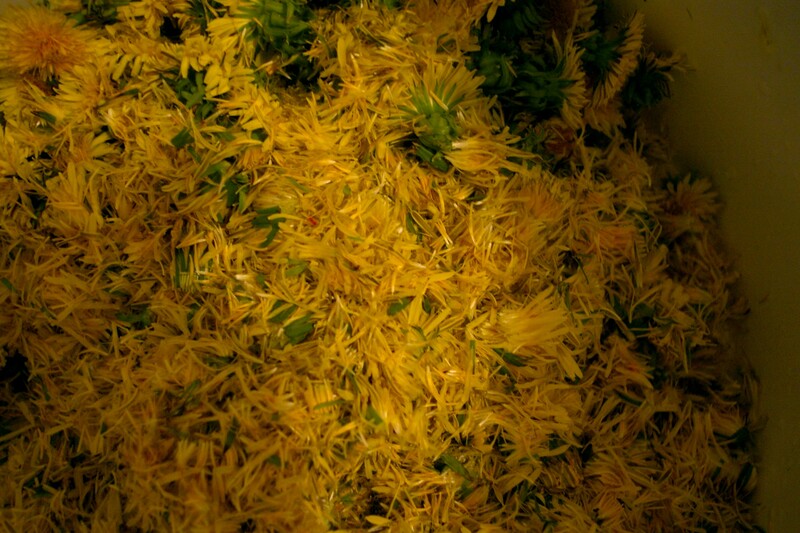 Spruce tip time ended yesterday, and we’re in the high throes of dandelion season, so those are the two harvests I’ll share with you right now. Is your mouth watering yet? 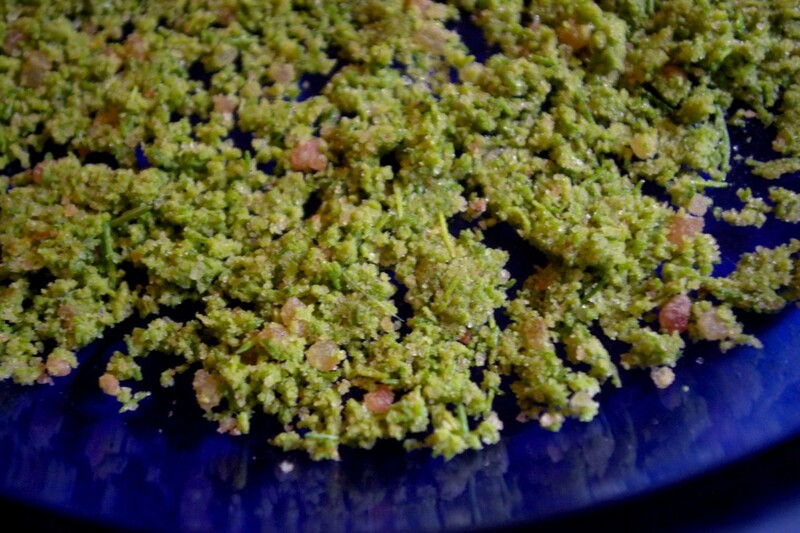 It should be, even if you’re not familiar with these bursts of pine and citrus and vitamins. When you first bite into one, it comes as a surprise… but keep chewing and you’ll start to get it. These morsels are the new growth on the ends of spruce branches, and you can pick them like berries. They begin life when the snow starts to melt, nestled into a brown papery covering, and as spring accelerates they leap forth and become a little too piny for pleasant eating. You must catch them at the right moment. 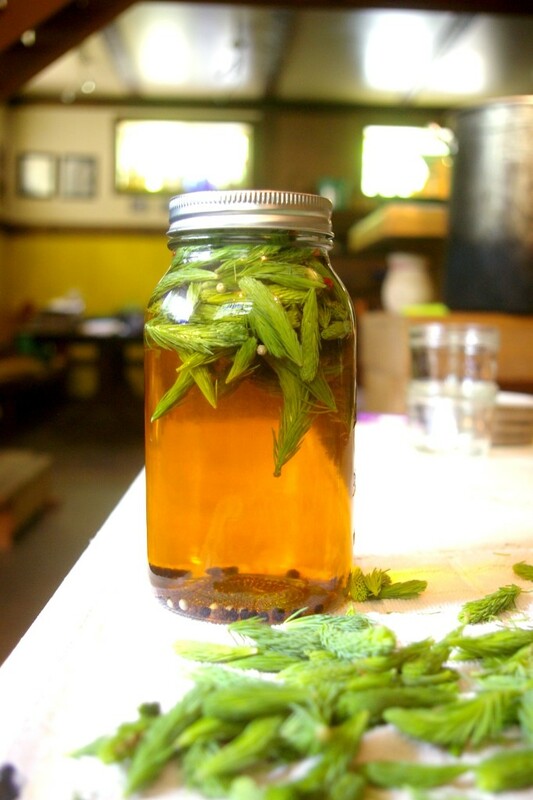 Recipes scattered across the internet say they make a great substitute for dill as a flavoring; spruce tip tea is an ancient standby for spring coughs and colds; fried in garlic and butter, they are heavenly; they keep fresh in the refrigerator for many weeks; and I, being the person I am, made pickled spruce tips, spruce tip-infused vinegar, and spruce tip salt. 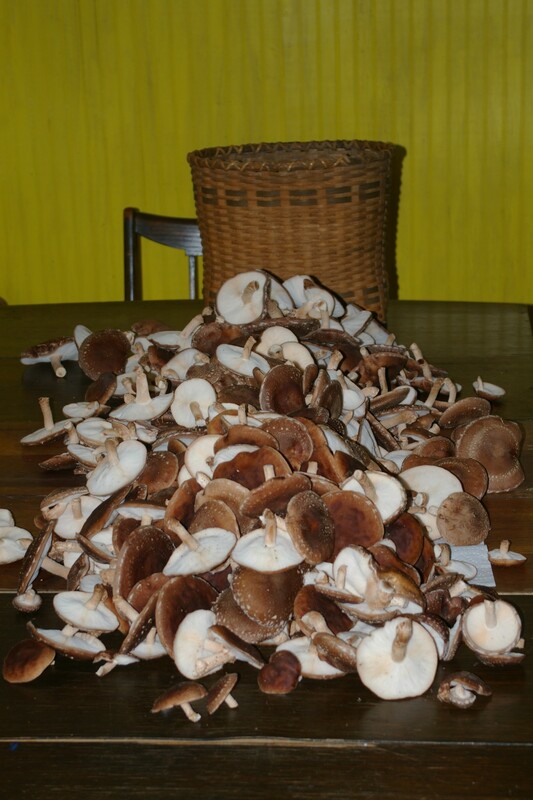 We will use these culinary lovelies to make the rest of the year taste better, and each bite will remind us of what awaits in the woods if we only pay attention. Now, the much-maligned dandelion gets a bad rap with city folks. 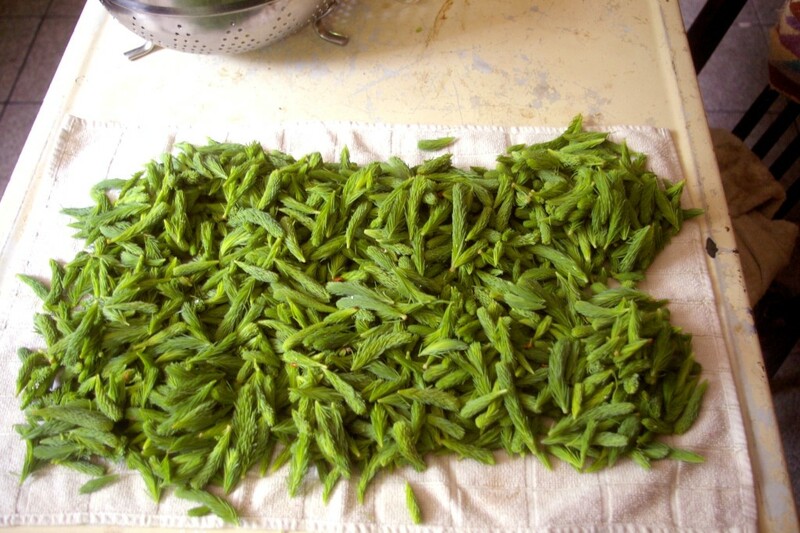 We, on the other hand, eagerly seek them out and eat them by the bushel basket. 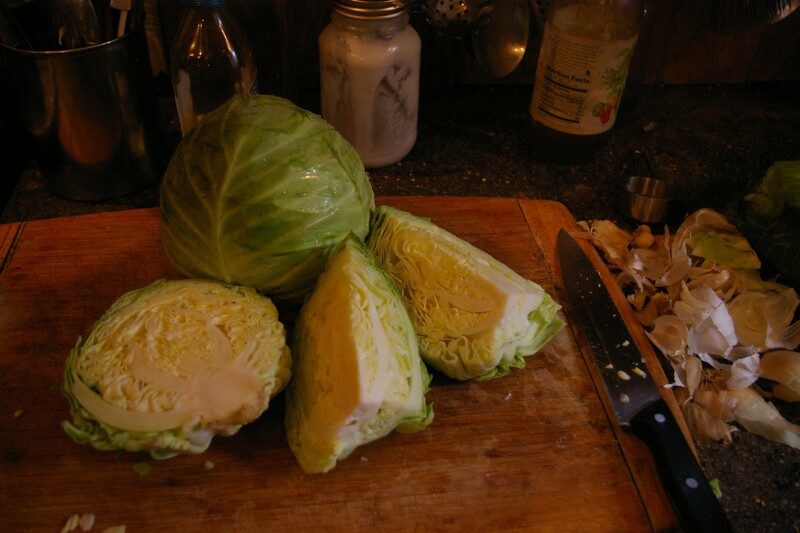 I prefer the greens raw in salad; other folks in our community like to cook them and enjoy with ham and mashed potatoes. 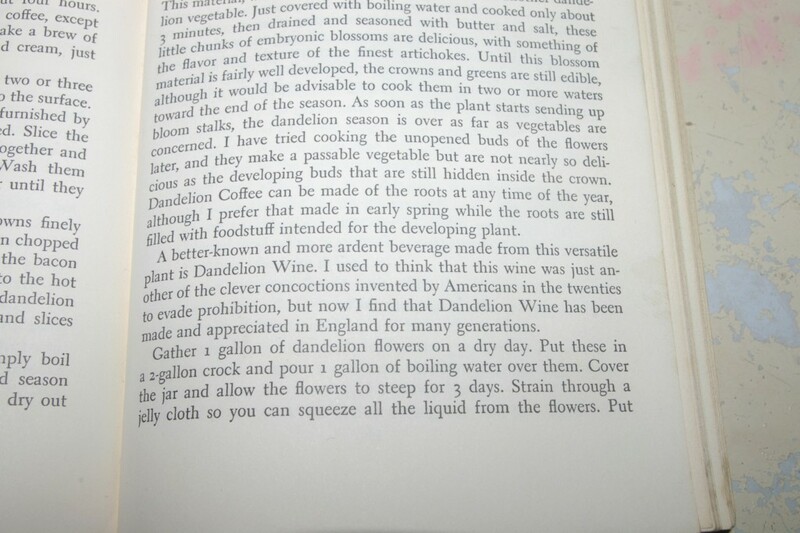 There are plenty of recipes for dandelion greens, hearts, crowns, roots and so on, so explore your search engine to learn more. If you leave a comment below, I’ll share any of the recipes with you. 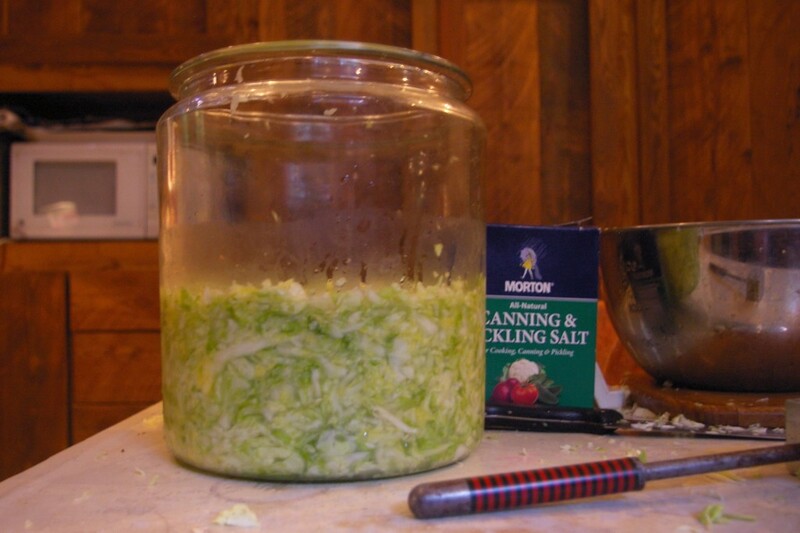 Do you do any fun homesteading projects? 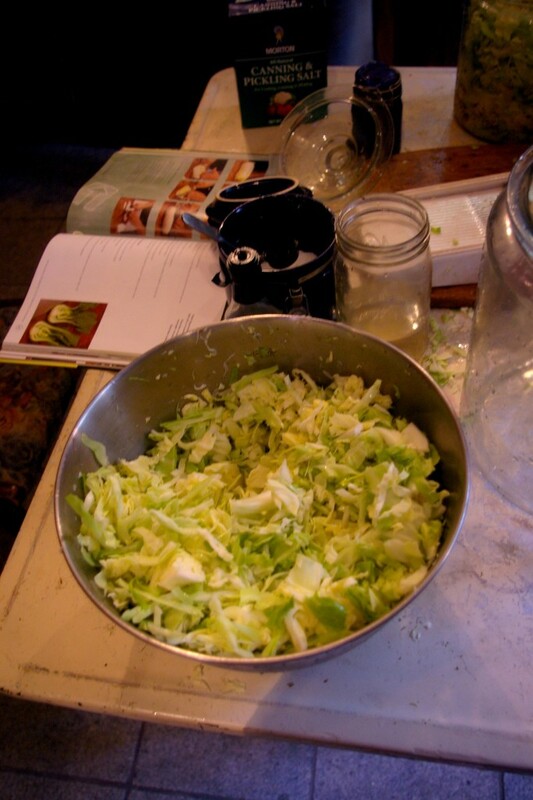 Gather any wild foods and enjoy the bounty of nature, on nature’s terms? Let’s have a conversation!